Lynell Burmark, education consultant and speaker, explains how video editing software on mobile devices can bring learning to life for students. For four years now, my colleague Warren Dale, formerly the technology facilitator at Mulholland Middle School in Los Angeles Unified School District, has been telling me about the transformative effect of putting 1:1 personal learning devices in the classroom and turning students loose to make videos with iMovie. I believed him. In fact, I even Skyped into a classroom where he was working and — cleverly disguised as visual literacy coach "Auntie Lynell" — critiqued students' movies. But the whole concept didn't totally come home to roost, pardon the pun, until recent incidents in my nieces' chicken coop. When I went to visit the girls for Easter, they had just purchased an elaborate chicken coop to house six hens, including Sam who, as any Seuss fan would suspect, lays green eggs. The elder niece, aged ten, was planning to write a novel about the hens, complete with character development and an elaborate plot about a girl named Emily and her interactions with the flock. I suggested that she use the iPad and take pictures to introduce the hens and document events in and around the coop. She had started forwarding pics and texting me story snippets when we decided to get iMovie. Within 24 hours, she sent me the first movie trailer from Chicken Films™ about six hens on the run. Dramatic music, hilarious sub-titles, portraits of the hens — the movie was nothing short of amazing! Besides the hens, the star of all subsequent movies has been budding actress and conveniently accessible younger sister, aged six (pictured here with the hen named after her kindergarten teacher). 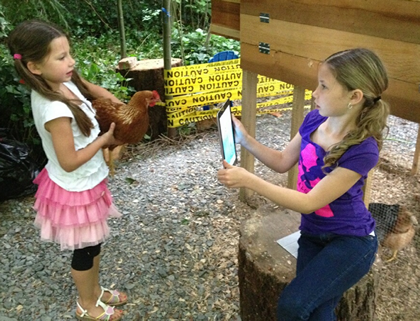 Students use an iPad to make a movie about chickens. Every event in and around the coop is fodder for more writing, another movie, and another trip to Google. First, the attempted break-ins by two persistent raccoons led to research on "predators"; then, vicious squabbling and bleeding beaks led to discussions about "pecking order" and more research about pecking chickens and beak trimming. No one ever had to assign anything to the girls or nag them to make another movie. I called Warren at 6:30 this morning and, for once, I was more excited about kids making movies than he was! I added that I would love to be the classroom teacher in a room full of moviemakers, where my job would be to watch great videos, ask the occasional guiding question, possibly suggest a spell- or grammar-check from time to time, and celebrate with the students how much they had learned from their own self-driven research, observation, documentation, analysis, creative organization of material, and sharing their movies to get feedback (including accolades!) from peers and other viewers. Warren reminded me that there was also quantified data, aka "evidence of impact on student achievement" to back up the positive benefits of putting iMovie in the hands of students. When he was at Mulholland Middle School, he went classroom by classroom, enhancing traditional curriculum with project-based learning, leveraged with technology. The first success story came from students who had been trapped in English language learners' classes for six years with virtually no progress. After less than five months (November – April), enabled and motivated by handheld devices, 73% of these ELL students transitioned out of the program into regular classrooms. Similar "miracles" occurred in the special needs classes. All the cumbersome equipment and expensive assistive devices were replaced by one $500 iPad for each child. More rewarding than just the money saved was the transformation of the special needs kids themselves. As one parent put it so poignantly: "The other students used to see our son as just a kid in a wheelchair. Now they see him as a kid with an iPad. Cool." In fact, the "cool" kids became school-wide technology tutors. Speaking of school-wide, Mulholland Middle School posted 30-point gains on their API scores – six years in a row! So, whether you have a couple of adorable nieces or a school or district full of disenchanted students, download the $4.99 iMovie app to those rockets in their pockets. It will rock their world and launch yours in the process.